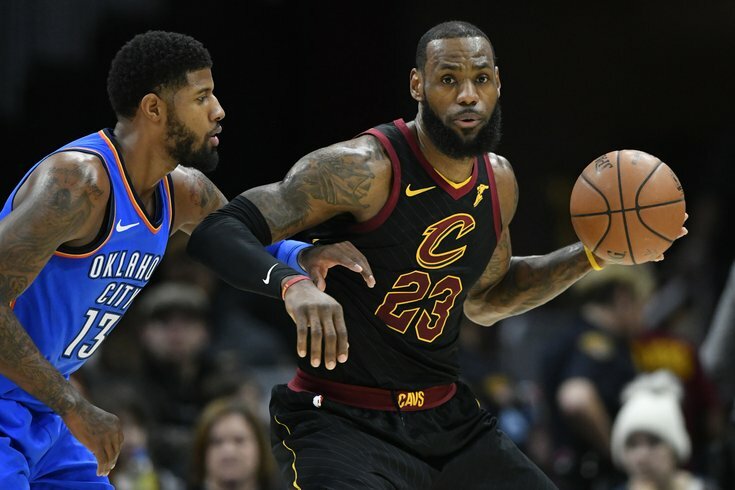 Paul George and LeBron James are by far the biggest free agent prizes this offseason. Just a lazy Friday at the office at PhillyVoice.com, and with NBA's free agency blitz set to start this coming weekend, the arguing and pontificating on the future of the Sixers was a topic of discussion. Below is a snippet of a debate in a Slack channel between executive sports editor Evan Macy and deputy sports editor Matt Mullin arguing over which of the three biggest prizes Philadelphia should be swinging for. Is Sixers' offseason a failure if they don't lure a star to Philly? They are, of course, 33-year-old LeBron James (unrestricted free agent), 28-year-old Paul George (unrestricted free agent) and 27-year-old Kawhi Leonard (on the trade block in San Antonio. What should the Sixers do? Evan: Lets start with Paul George, who I'd honestly prefer of all three. Matt: It’s LeBron. He’ll fit. Lol And you wouldn’t have to give up assets like you would with Kawhi. Evan: Yes and then he will do this every year [assuming he signs another one-year deal]. And he will take over the front office. Matt: It’s the best player in the history of the game, still in his prime. Give me the title and we’ll figure the rest out later. Evan: I'd rather George for four years than LeBron for one. Matt: They’d still have their core intact and could go after another star next year. I don’t think that’s enough to win. Evan: Yeah, I don't think the Sixers with LeBron will beat Golden State. I am thinking three-to-four years down the line, they want to be the next dynasty. Matt: I get that, but who knows what the rest of league will look like in three years. And I don't know if that’s even enough to beat Boston, honestly. Especially if they get Kawhi. Evan: Honestly, if LeBron goes back to the Cavs for one more year that might be the best scenario in my opinion. Get LeBron one year later. And add a Paul George or Kawhi Leonard this year and let the youngsters grow. We have no idea what Markelle Fultz or Zhaire Smith will even be. That [plus Joel Embiid, Dario Saric and Ben Simmons] could be the damn starting five right there anyway. Matt: Well yeah, but I’m assuming for this argument that if no LeBron this year, then no LBJ at all. Evan: I will, I guess, admit that adding LeBron for $36 million for one year doesn't hurt the future. Trades and crazy over-extended signings in addition does. Matt: Yeah that’s all I’m saying. And they get to keep that Miami pick and possibly use it in the future. They have options, for sure. Evan: Which could be a pick we want, if it allows us to draft a high schooler in the lottery. LeBron James Jr. is the real prize! Evan: He's class of 2023, I think, which is a straight jump potentially. Matt: Imagine him and LeBron on the same team like Ken Griffey and Junior? Evan: Senior would be 38 when junior is 18. Very possible. Matt: Absolutely. Omg, but imagine them playing against each other? Jr. guarding Sr. and vice-versa? Evan: Not to take a tangent, but that's a great post. What would win the all junior or senior team of athletes? Matt: Woulda been perfect for Father’s Day. If you could only have one of the three, which would you prefer?